ARE YOU STRUGGLING EVERY DAY TO BALANCE BOTH MOTHERHOOD AND WORK? DO YOU WISH TO SPEND MORE TIME WITH YOUR CHILDREN WITHOUT WORRYING ABOUT MONEY? DO YOU WANT TO HAVE ANOTHER CHILD BUT FRET OTHER YOUR FINANCES? MOTHER INDUSTRIALIST shares real and inspiring stories of how you can perfecting balance both Motherhood and Business. Start spending time with your children without worrying about losing profit. 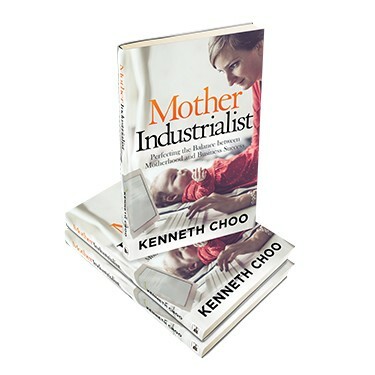 If you are a working mother or mother-to-be who would like to strike a balance between caring for your family and succeeding in business, Mother Industrialist shows you how! With freedom in time and finances, you can escape the pressures of the working world. As an entrepreneur — or “mompreneur” — you have the ability to spend time with your family, improve your financial situation and even have more children if you wish. Author Kenneth Choo offers advice on starting your own business and claiming the happiness you deserve. He shares insights about the working world as well as the personal stories of 15 women who transformed themselves into thriving mompreneurs. Today, more than ever, you can choose to live life on your own terms, to craft a future for yourself and your family that is emotionally and financially rewarding. Mother Industrialist will set you on that path.